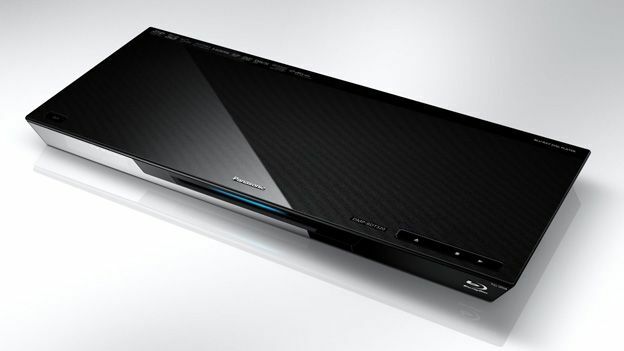 The Panasonic DMP-BDT320 3D Blu-ray player dares to be different but does it pay off? The Panasonic DMP-BDT320 is the brand's top of the line high-street disc spinner. You'll find it parked just ahead of the economy 7 Panasonic DMP-BDT220, but behind the brand's gleaming audiophile DMP-BDT500. It's stupidly slim, but packed with clever tech. The model is aimed squarely at the hi-tech Sony BDP-S590 and makes the likes of the £500 Onkyo BD-SP809 look like a relic from the Stone Age. Obviously networkable, this player has access to copious catch-up TV and VoD from Panasonic's VIERA Connect portal. BBC iPlayer, Netflix, YouTube, Dailymotion and Acetrax are the big names on offer, but there's plenty of other content available. Social media apps for Facebook, Twitter and Picasa are also provided, as is Skype (optional HD camera required). Multimedia playback from USB is similarly impressive. MKV and FLAC both fly, as does regular fare such as AVI, MOV, MP3 and WAV. However, if you store your content on a NAS, you'll need to manually enter the IP address and shared folder name of your device in order to stream your files. If your eyes have already glazed over at the prospect, best forget about LAN streaming altogether and invest in some big thumbdrives. It may be a mere 27mm tall, but this deck accommodates HDMI, phono AV and optical digital audio connections. There's also a back-panel USB input for a Skype cam. On the front fascia is a flap concealing a secondary USB for media playback, plus an SD card reader. Wi-Fi is integrated. The BDT320 uses a slot loader rather than a tray, augmented by a sensor which illuminates ingress when your hand closes in. Disc loading times are fast, with Java heavy discs delivered onscreen in around 50s. We're less keen on the new zapper. While superficially funky, it proves a chore to use. Navigation is via a series of coded strokes. There's a single tap to Enter, while a downward brush takes you, well, downwards. But the remote often seems unable to distinguish between them, leading to a chorus of Simpsonesque D'Ohs from the user. Not only does this deck offer sublime HD video playback, it's also great with audio. Panasonic has introduced an ingenious two-step Super High Clarity mode designed to improve the player's sonic performance over HDMI. Step one shuts down the video DAC within the deck's UniPhier chip (where all the real work is done) to reduce electrical noise. Step 2 blanks out the HDMI video output entirely, for even greater audio purity. Such engineering finesse is unheard of at this price point. If you're looking for a Blu-ray deck that delivers not only from disc, but media files and IPTV, then the BDT320 won't disappoint. Watch out for that touchpad controller though, it's not an easy beast to live with.